I was awoken by a loud banging on the door - "Our guide is here" bellowed Mr Vaughan in a head masterish type of voice. Shi*t...my alarm had failed to go off! And then it dawned on me - I had failed to update my mobile phone to Polish time (1hr ahead of GMT). I hastily got dressed, grabbed what I needed and dashed to the car park. The guys and and our guide (Mateusz) were waiting - a quick apology for my lateness and we were off to our first stop of a very long day..Bison! 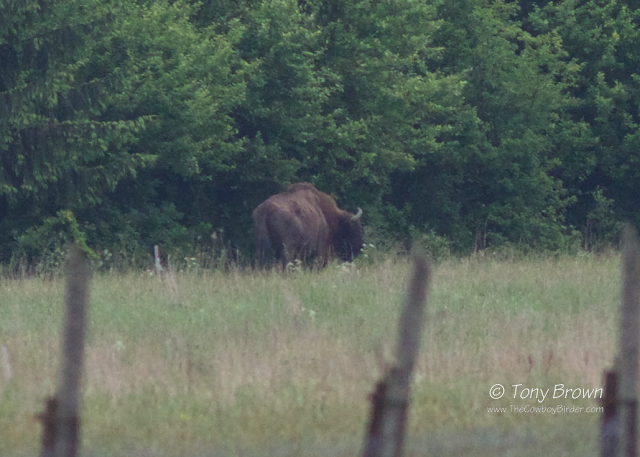 A short drive and we watching a single European Bison feeding distantly in a large water meadow, great to see but I'd hoped to of seen this beast of an animal a little closer. Next up on our list of target birds was White-backed Woodpecker. We were led by our guide through a tangled wet woodland trail, the trail was bogy and with the rain falling and my head banging (that'll be the Vodka) I was beginning to think I should have stayed in bed! 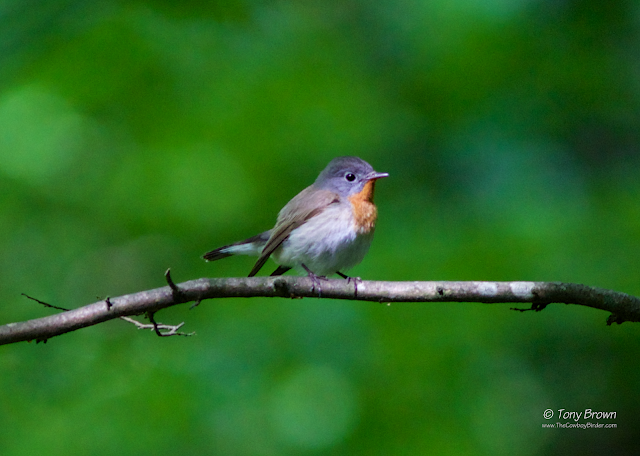 But once we'd reached the location and after waiting a short time our target bird showed - lifting my spirits! The forest was alive with singing Wood Warblers and calling Collared Flycatchers, we also enjoyed views of a stunning male Red-breasted Flycatcher. 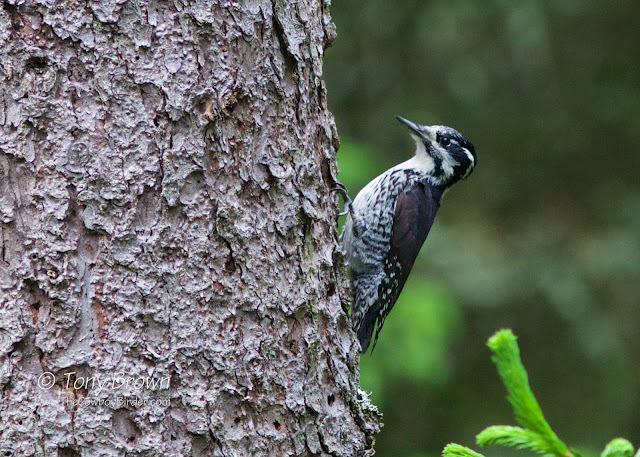 Matuesz quickly followed up White-backed Woodpecker with a pair of Middle Spotted Woodpeckers at a known nest hole at a location near the town of Budy, we could also hear the flutey song of a Golden Oriole and the contact call of a Black Woodpecker nearby, but failed to connect with either. Our next stop was the Strict Reserve (an untouched area of forest, which was still in its primeval state). 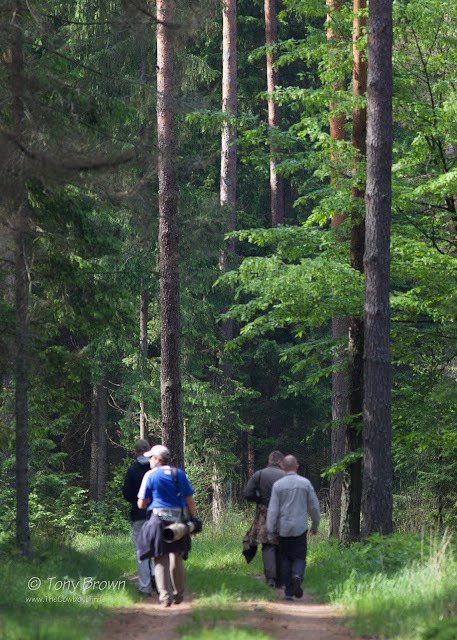 We took in a large loop of the forest and was one many groups being guided through the area as is the reserves policy in not letting tourists walk just anywhere in this part of Bialowieza Forest. 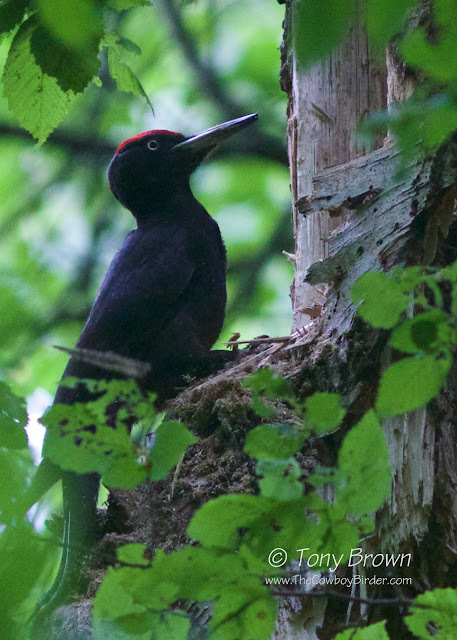 We’d just stepped through the wooden gates when Bob (I think it was Bob) picked out a Black Woodpecker making short work of a dying Birch tree – this was my first Black Woodpecker and was blown away by its size, I knew they were big, but I hadn’t quite appreciated how big – this looked like a Crow on steroids with a Kango machine strapped to its head! 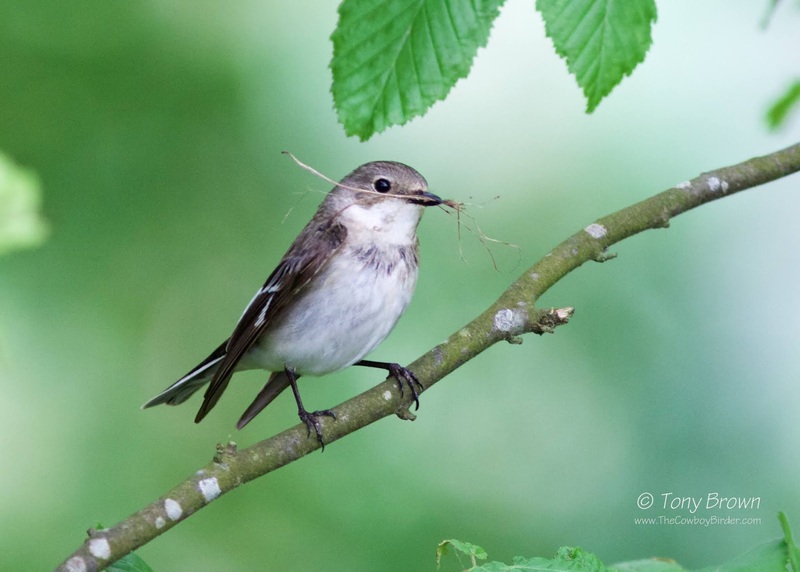 As we looped the forest trail we managed to find a Lesser Spotted Woodpecker, another Middle Spot and countless Collared Flycatchers and more singing Wood Warblers. As we left the Strict Reserve a pair of Honey Buzzards circled overhead and were taking advantage of the improvement in the weather. 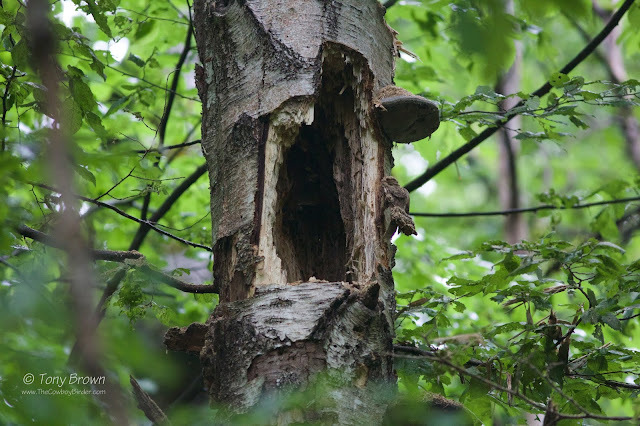 Our first dip of the day was Grey-headed Woodpecker at a nest hole in the Palace Gardens – much to the disappointment of Jono, who had had a run of bad luck with these birds, but our guide soon retrieved the situation by leading us to a Pygmy Owl nest hole a short drive away. Disappointingly we only ever got head views of the bird as it pocked its head out of the nest hole to investigate what that scrapping noise on the trunk was – That’ll be Mateusz doing his best impression of a Pine Martin! Lifted by the success of seeing Pygmy Owl we headed to Czerlonka in search of Three-toed Woodpecker a bird the team and I were keen to catch up with. An Initial search in a favoured area drew a blank – was this going to be the second Woodpecker dip of day? Then, as I pointed out a Honey Buzzard going low over the tree-line, a voice from the back of the group shouted “Three-toed”! 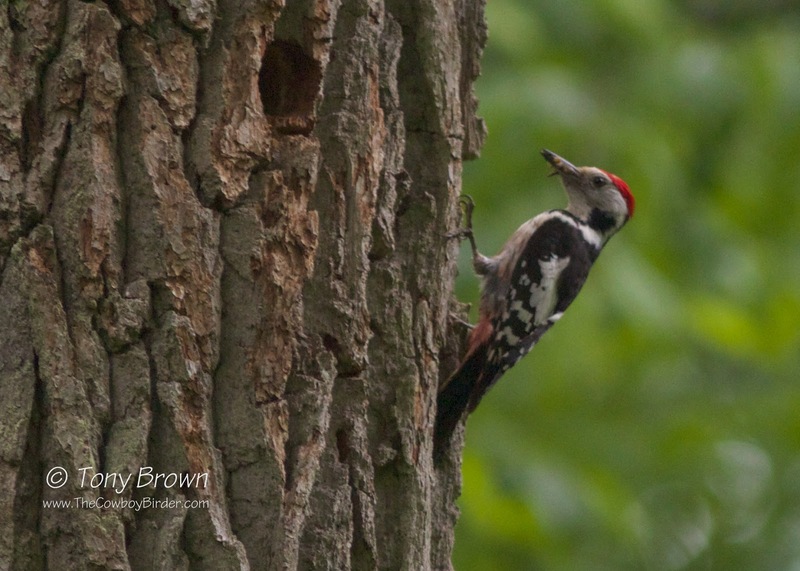 Bob had found the elusive Three-toed Woodpecker a female, our luck had changed, and it was visiting a nest hole giving us all great views much to the delight of the team and our guide. 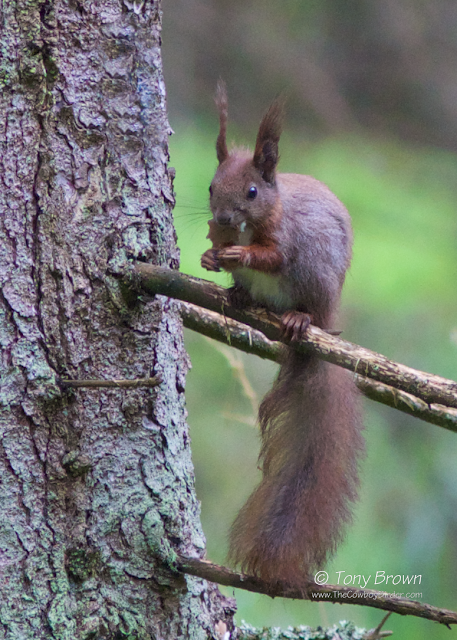 Red Squirrel, so much better than those yank Grey's! The next couple of hours were a bit of a blur! 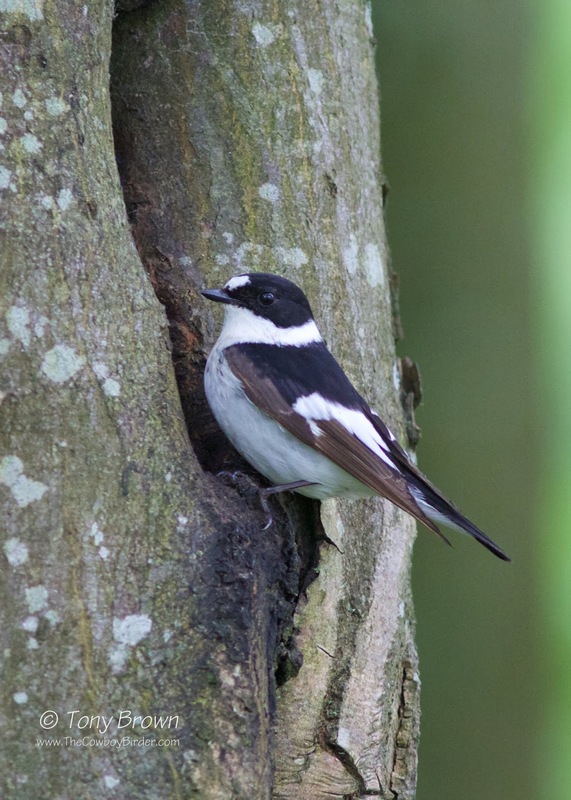 The plan was to visit a known site for Nutcracker and Tengmalm’s Owl but this involved a long trek through the forest and later along a disused railway line. It was now after midday and we’d been going for over 8 hours and the temperature was rising - we were all starting to feel the pace. For all our efforts, disappointingly we failed to locate either of our target birds, which made the long walk back even more difficult. The plan now was to head back to Bialowieza Village to freshen up and to get something to eat (Wild Boar) before heading to the Narew Valley and the Great Snipe lek. On route back we stopped off for an obliging male Red-breasted Flycatcher and a second attempt at Grey-headed Woodpecker. This time we struck lucky, much to the delight of the team and especially Jono. Matuesz had worked his magic, as he whistled towards the tree the bird obliged by appearing at the entrance nest hole and then came out and flew across the meadow and out of view. Back at the accommodation whilst the guys made the most of a much needed break (grabbing 40 winks) I spent my time showering and brushing my teeth having failed to do either in my haste this morning! Refreshed again, we picked up Mateusz and headed north for about 90 minutes to the Upper Narew Valley. Arriving on site as the sun was setting conditions were perfect, still with clear skies – These conditions were also perfect for mosquitoes as the boggy marsh was covered in the little bloodsucking blighters! Thankfully I’d packed my Jungle Spray much to the relief of the rest of the team. Walking out onto the marsh we could hear our first Corncrake calling, this soon turned into a second bird and then several others. We honed onto the closest calling bird but despite our best efforts couldn’t see it for the love or money – the bird was literally calling around our feet and we could even see the grass shake as it moved around but frustratingly it just wouldn’t reveal itself. Moving on to view the Great Snipe Lek, Mateusz pointed out a distant ridge approximately 100 metres away. It was then Mateusz said he could hear a bird calling near to where we were standing and then a bird took flight and landed in the long grass not too far away, despite the fading light the bird was still visible, and with scope and bins trained on it, for the next 20 minutes or so we all enjoyed one of the most amazing sights, as this Great Snipe put on an display of bill-clacking, then stretching its neck out and pointing its head to the sky, with the occasional tail wag, displaying those white feathers – this was repeated several times before the bird eventually flew off. You could tell by the broad smile on Mateusz’s face that we had witnessed something a little bit special. 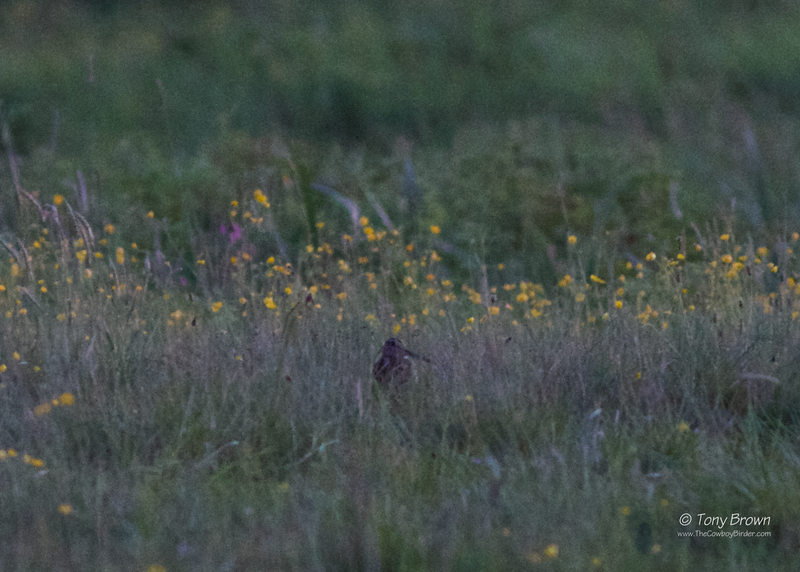 In near darkness the marsh was alive with bird song and along with Corncrakes we also heard Grasshopper Warbler, Thrush Nightingale, Woodcock and churring Nightjar. 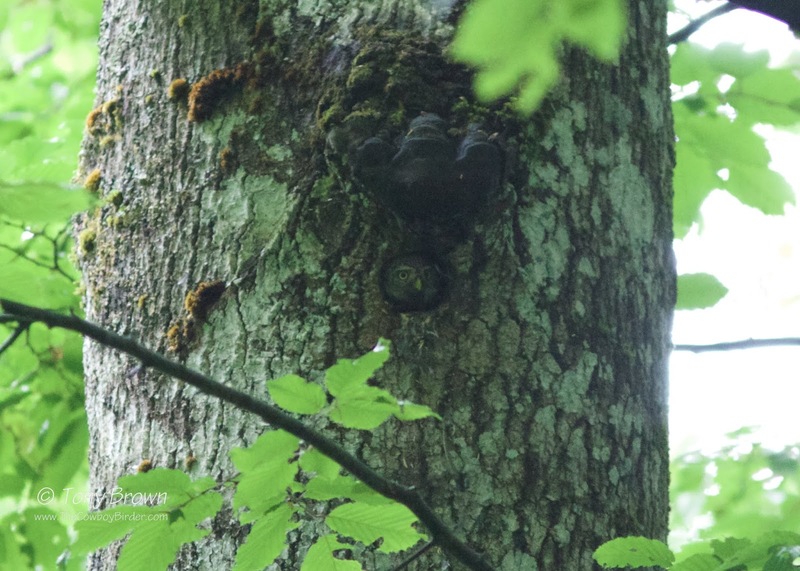 As we headed back to Bialowieza there was just time for one more stop off at a known River Warbler site, and true to form as we pulled up in the cars in pitch blackness we could hear the unmistakeable metallic sewing-machine sound of a bird singing close by. It was now after 10pm and we’d been on the go for about 18hours, we were all exhausted but agreed it had been a day to remember. Is there a better sound?